Pardon the paint splatters at Merchant Ships this week. As you can see, I'm doing a bit of redecorating! Frugal Upstate's improve-your-blog contest gave me the fever (though I'm not participating per se.) I've been meaning to do it forever, but with a limited amount of computer time, I nearly always choose posts over html. 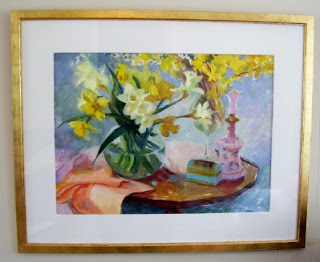 The painting above is one my mother bought for $45 at a local consignment shop--a good buy for original artwork, don't you think? Daffodils are and will always be my favorite flower. My mother planted a thousand bulbs in our childhood home, and yellow was my first word. It looks very colorful and clean-but I always associated you with the more gracious colors and old fashioned colors rather than the brights-but that's just me. If you aren't going to the 3 column style there are some great beta templates out there you could check out too. . . .
Love the painting! And how about I didn't know about the improve your blog thing either, but I just revamped my whole thing too! Oh well.